Did Baba Suwe kill Monsurat Omidina (Moladun)? The death on Tuesday of popular comedian and actress, Mrs. Monsurat Omidina (popularly known in Nollywood circle as Omoladun Kenkelewu) is generating ripples and has left many questions unanswered. What could have made the woman foam in the mouth, bleed through the nose, causing her to die suddenly? A writer even claimed to have seen bruises on her neck. If this is so, what could have caused it? These are questions Woman Arise, an NGO fighting for the rights of women and some doctors we spoke with are trying to unravel. Women Arise, led by Joe Odumakin, has written to the Lagos State Attorney General and Commissioner for Justice, Mr. Supo Sasore (SAN), requesting that the corpse of the deceased, which was interred on Tuesday be exhumed to undergo a coroner's inquest to determine the cause of her death. This is coming on the heels of an online report that alleged that her husband, Babatunde Omidina a.k.a. Baba Suwe might have aggravated her hypertensive condition by assaulting her, thereby causing her death. In a letter signed by Mrs. Odumakin, the organization quoted the online report conspicuously to back up it request. The organization maintained that the coroners' request would either acquit Baba Suwe of any guilt or convict him if it is true he committed the crime. Dr. Namso Okon of Golden Care Hospital, meanwhile, has said that if there was blood in her nose when she was found dead, then it might be as a result of high blood pressure. But with the foaming in her mouth, he said there is need to ask questions if she had convulsion before she was found dead. If not, he said it meant that she must have gone through emotional trauma or hypertension. It wasn't funny watching the hilarious comedian weeping. Baba Suwe was almost inconsolable and he almost jumped inside the grave when the remains of his late wife were about to be lowered. It took the quick intervention of Jide Kosoko and Yinka Quadri to prevent him from jumping into the grave. One of the late actress' children, Junior, was said to have discovered her lifeless body and raised an alarm when he went inside her room to wake her on Tuesday morning as she did not participate in the early morning saari break for the ongoing fasting. People rushed in, including her 28-year-old first daughter who saw that she was foaming in the mouth and had blood coming out of her nose. She was rushed to the Ajayi Hospital around Elepe where she was confirmed dead. The doctor's report was said to have indicated that she died of high blood pressure, an illness she was said to have been battling with for some time but have succeeded in keeping under wraps with medication. Her corpse was brought home and she was buried in the compound later in the day. News of her death was greeted with shock and disbelief because she was believed to be healthy. The late actress was said to have been planning to visit the British Embassy that Tuesday morning. The Islamic cleric that conducted the burial rites said he saw her three days earlier when she and her husband played host to a group of clerics. Narrating her experience, the deceased first daughter, Lara said her mother's death was least expected. “I met her preparing dinner when I came back. I wanted to take over from her, but she refused saying I should see off my fiancée who came by. I was surprised that she did not come down to wake us for 'saari' (the Islamic mid night rising to eat during fasting). I thought she was tired. In the morning, I was there in the compound cleaning the compound when I heard noise from her room. When I got there, she was foaming in her mouth and blood was coming out from her nose. We rushed her to the Ajayi Hospital and I left to call my elder brother who had gone to work. He called me back to inform me that she had died. And we were just planning my introduction. She is somebody I cannot forget', she said. Explaining what could be the cause of her death, Dr Dele Adeosun of Ayodele Medical Centre in Oko Oba said the fact that she was bleeding from the nose meant two things; it was either she had high blood pressure or that she was traumatized. Adeosun said the blood veins must have burst in her brain and that could have been responsible for the bleeding through the nostrils. He also said it could also mean she was traumatized. But when told that the woman had history of high blood pressure, the doctor said it could be high blood pressure and that it would be due to Cerabro Vascular Accident (CVA). CVA is a process where a blood vessel burst in the brain. That was perhaps what was responsible for her sudden death. According to him, the deceased may have been ignoring some symptoms, which were tell-tail signs of her ill health. 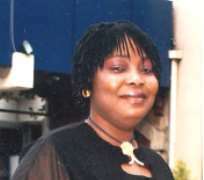 Omoladun, who died as one of the foremost female comedians in the Yoruba genre of Nollywood actually did not start out as comedian. She started by acting serious roles. One of the roles that brought her to limelight was Ita Okanlawon in the popular soap opera. She had two children before she married Baba Suwe and had other two children for him before she died. Moladun started her acting career in Ibadan with a Yoruba Sunday television sitcom titled Okanlawon. The television drama was aired on BCOS and OGTV (now Gateway Television). It was about how a widow suffered so much to raise her only son through the odds. Moladun showed her acting prowess in that tragic comedy television. She was a poor widow who weathered the storm with her only son, Okanlawon. The television drama was an instant hit in the southwest in the early 90's back then and everyone rushed home after church to watch 'Okanlawon.' This is contrary to the belief that she started off acting as a comedian in Baba Suwe's comedy drama entitled 'Erin ke ke'. The questions begging for answer are: Did the late Monsurat die a natural death or her husband of over a decade has a hand in her death? Time will surely tell.